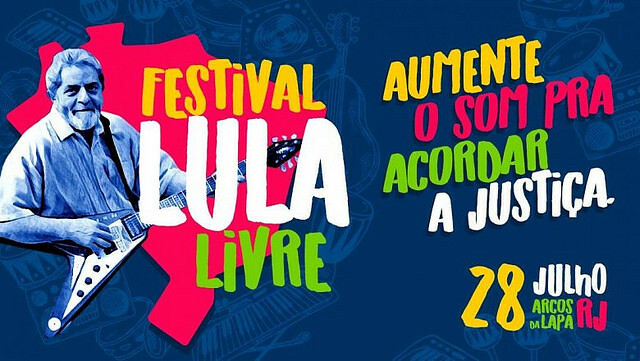 The Festival Lula Livre – or “Free Lula Festival” – will gather artists, intellectuals, and people’s movements in defense of democracy and freedom for Brazil’s ex-president Luiz Inácio Lula da Silva next Saturday in Rio de Janeiro. Organized by the People’s Brazil Front and the People Without Fear Front, the festival will start at 2pm with artistic and cultural performances by the Lapa Arches, in the city center, including plays, parades, and DJ performances. The music concerts are scheduled to start at 5pm. More than 40 Brazilian funk, rock, hip hop, axé, samba, and MPB artists will go onstage, including big names such as Beth Carvalho, Chico Buarque, and Gilberto Gil, in a concert-demonstration that will definitely make history in the Marvelous City. More information at the Festival’s Facebook Event Page.